I had the opportunity to try out this wonderful eye lash serum from Sieva. I have always had short stubby eye lashes and in fact for some time of my life I went to the trouble of wearing fake eyelashes (of course after having children it didn’t seem that important). After finding Sieva though I will no longer need them!! You simple use the applicator to put this on your eyelashes and before you know it they will be stronger and longer!! Sieva is an amazing eyebrow and eyelash conditioner and works great to make both your eyebrows and eyelashes look great and feel healthy. I put this on just once a day and after just a week I felt like my lashes were stronger looking and healthier. My eyelashes now look amazing! I love this product! EASY ON YOUR EYELASHES: Sieva’s InstaLash Growth Enhancer aims to nourish your lashes to bring out their fullness and length potential, along with their natural youthfulness. It is a convenient, easy-to-use serum with a once a day application that allows you to achieve a noticeable difference. It is also lightweight and does not feel heavy on the lashes. To use on an eyebrow, simply apply to your brows after cleaning. LAB TESTED: 17% increase of eyelash length shown in 30 days. 19% increase of eyelash diameter shown in 30 days. 3 times more eye lash volume shown in 15 days. 100% SATISFACTION GUARANTEE – Sieva Skincare put their heart and soul into producing its elegant and unique range of products. Happy customers is the lifeblood of our business; With that being said, if you are not completely satisfied with the results from using our Eyelash enhancing serum, no matter when or where you purchased the product, simply contact us at any time to receive a full manufacturer’s refund. LONG TERM BENEFITS: Lashes are constantly invaded by lash curling, cosmetic application, heat, rubbing, allergies, and the unexplainable act of hair-pulling. 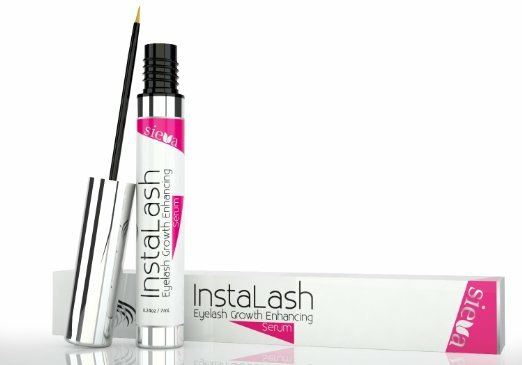 InstaLash is a high performance lash lengthening serum designed to transform eyelashes in just two weeks. It stimulates long term vitality and strength of your lashes by helping to prevent thinning and breakage. It is the purest and least irritating eyelash stimulating and conditioning product available and safe for even the most sensitive eyes.